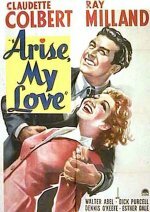 Claudette Colbert and Ray Milland co-star in this superior comedy-drama-romance from Paramount, which won several Oscar nominations and the award itself for its story (by Benjamin Glazer and John Toldy), although not, surprisingly, for the polished and admirably topical screenplay by the 18-carat team of Billy Wilder and Charles Brackett. It audaciously combines wit and a love story with headline events of the Spanish Civil War and then the Second World War, both of which Paris-based newswoman Colbert is reporting while becoming involved with Milland. The film is sophisticated and gripping entertainment with a serious theme, and Mitchell Leisen's direction, backed by the resources of Paramount, perfectly catches the nuances.